The MCMUA has an experienced staff that is dedicated to performing water-focused presentations to schools,community organizations, and local municipalities in order to educate Morris County residents about where their drinking water comes from and how to preserve the precious resource. MCMUA Water Wheels - Your Guide To Home Water Conservation. Click here to read the water conservation tips listed on the water wheel. 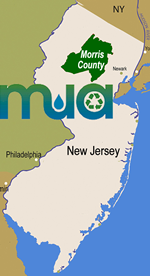 Contact the MCMUA environmental specialist at 973-285-8387 or at info@mcmua.com to request any of the above water educational material and/or schedule a presentation. Water Conservation Practices in and around the home. The Story of Drinking Water - How much fresh water is on the planet earth? What are three forms of water? These and many other questions can be answered by exploring "The Story of Water," an interactive program created by the American Water Works Association. Everyone, children and adults, can learn about the water we drink; just click here, and enjoy the learning, fun, and games.